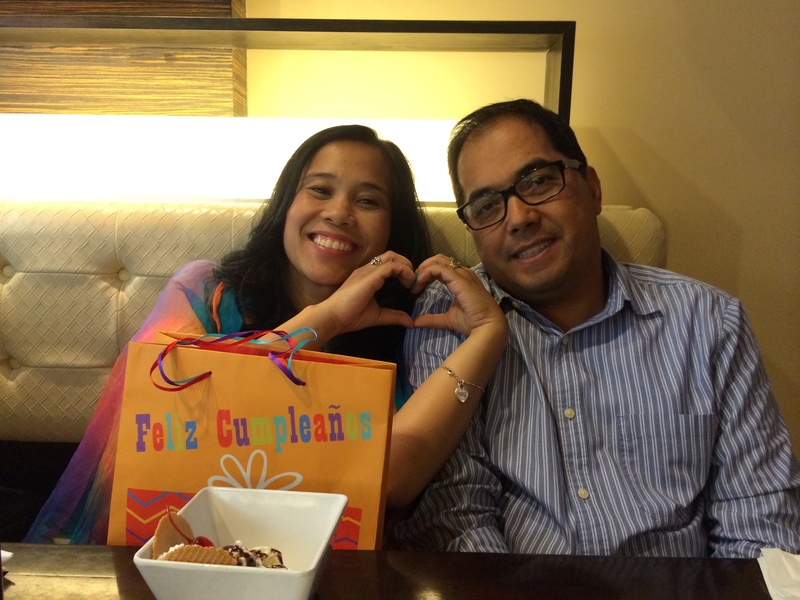 A “BIRTH” Day Celebration with Heart Gifts of HOPE! | Heart Gifts of H.O.P.E. My birthday is now just a reflection of a wonderful, blessed, joyous day gone by and I am grateful for having had another birthday to celebrate! 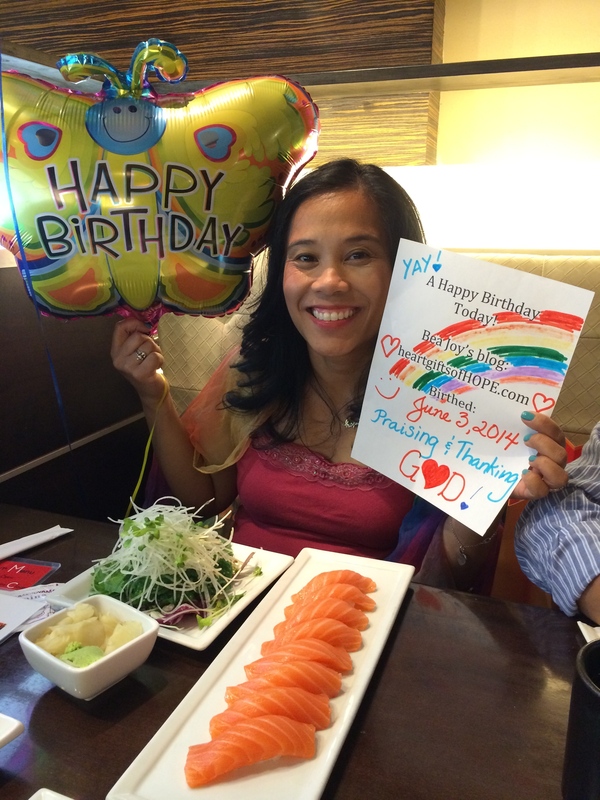 My sweet husband planned a few surprises for me, including dinner at one of my favorite local Japanese restaurants (Sumo in Newbury Park, CA)…but little did he know that I had a “BIRTH” day surprise announcement that I was excited to share with him! But in the end because of the God I know, serve and love, and because of promises from Him that He will equip me/provide for me everything I will ever need to accomplish the work (the labor) He has for me to do, I know He helped me birth this website/blog heartgiftsofHOPE.com for His purposes. I can do nothing and have nothing without Him! What a joy this is for me—this “new baby”! To finally have this blog and my first blog entry for His glory—it’s exciting! This blog exists because of God’s own loving desire to have me share His very own Heart Gifts of HOPE with the world. I am simply a mom, called to be an ambassador of Good News. I am called to share HOPE with JOY. I am called to share LIGHT and LOVE. God sovereignly orchestrated June 3rd, for the birthing of my blog (the official “technical” set up of this site). His orchestration of this special birth is part of every one of the days that His Word says that He ordained for me. I look forward to encouraging as many people as He would have me reach with HOPE and JOY that He gives me (despite even sometimes being in the midst of the most difficult circumstances I face or have faced.). You must know that my life is not/has not always been a piece of birthday cake, red roses, and colorful mylar balloons! But I do have HOPE and JOY in my heart that no one can steal from me because of God’s heart gifts of HOPE He grants me daily through His Living Promises, His Word to me. In this blog, may you be touched and inspired to live with abundant joy and hope as I share my life/my family’s life journey founded on Faith and God’s great LOVE for the whole world. May you gladly receive from God an abundance of Heart Gifts of HOPE with JOY. This entry was posted in Uncategorized on June 5, 2014 by HOPE with JOY. Dear Miss Joy, I am so very proud of you for stepping out in faith and allowing God to orchestrate this outpouring of your love to your community and to the world. I thoroughly enjoyed reading your first post and more importantly, I want you to know that it has achieved for me what you intended…inspiration. To see you persevere through all of the “birth” pains of the tech issues and just getting this set up demonstrates that you are truly being God’s hands and feet. Where God calls, he equips and you have shared that faith-building experience. For that, I am truly thankful! Actually, I am also entering a new direction for my life…a direction I feel God telling me to move. At 47 years young, I have decided that I want to be God’s hands and feet in my world and at my current career, I did not feel I was fulfilling that. I’ve always felt that God wanted me to help people, face to face. Not just help someone cross the street or share a smile (I do that all the time anyway :-). No, I needed to do something different…I am applying to nursing school! What a challenge it will be, but God is teaching me that there are no mountains too big to cross when He has my hand and is leading me. So I told you all of that to tell you that reading your blog just now encourages and inspires me to keep reaching for God’s dream for me, to be aware that no challenge in this new quest will be so big that it cannot be overcome. So in summary, I just want to thank you for stepping out and showing me that sometimes you have to navigate hills and curves and valleys, but when you stay focused on the light on the horizon you experience an energy that sustains you and gives you the drive to keep going. I love you dear sister and I cannot wait to read your next blog! Hi Sweet Kelli! Thanks for your comments and sharing such sweet support for my blog that is all for HIM who calls me to do His work of sharing HOPE with the world. I am glad God used what I wrote to inspire you. You too have inspired me truly and the inspiration to not give up on what God has called me to do. I will always remember you as my Sister in Christ who encouraged me personally when we first met and through your handwritten note “write a blog- and I’ll be your first follower!” (It truly was a blessing/a heart gift from God to meet you in North Carolina at the Billy Graham Training Center last March!) I am so excited Kelli to hear of the new calling God has for you and that you are enrolling for nursing school! I just got the good kind of chills right now knowing that God has great plans for you and He will bless you as you seek to please Him in this new calling! I will be praying for you as you step out in faith! You are going to be a great nurse! congratulations on your new nursing journey Kelli! Reading your share put a smile on my face! I love hearing others following their dreams and taking chances. I did the same about 2 yrs ago and am so blessed to be helping others face to face. Joy has shared what a special person you are. All my best to you!! Hi Jo! Thx so much for your well wishes and support of “my baby” (my blog). I am so thankful God helped me in the birthing process and that he helped me step by step so that I could receive this gift. It’s my heart’s desire to share this gift with the world. I couldn’t have set up this blog without HIM leading the way for me and providing the “know how” when I didn’t know how:) God is wonderful! I love HIM!